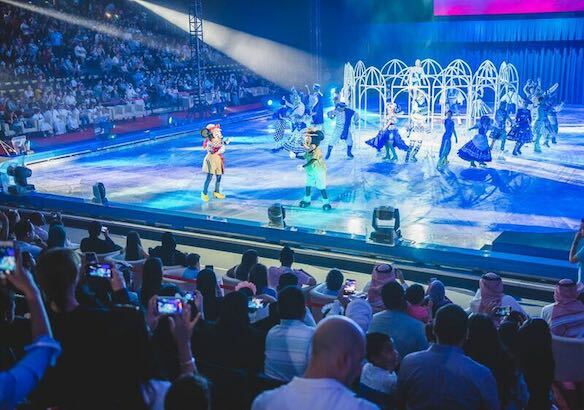 Disney’s characters took the stage for a spectacular performance in the much-awaited ‘Disney On Ice presents Passport to Adventure’ which debuted in Bahrain on Saturday 16th June. The show will run for 5 days, until Wednesday 20th of June 2018 and is held at the Bahrain International Exhibition and Convention Centre. In line with its commitment towards offering its visitors a memorable experience, the Bahrain Tourism and Exhibition Authority hosted kids from several local charity organizations to enjoy the show including Branch of Administration and Compensation of Martyrs and Injures, Child Wish, Royal Charity Organization among others. The show, aimed to offer visitors an unforgettable entertainment experience, will be filled with Disney music and magic in every scene. Audiences will discover four unique landscapes at the ice show, each filled with Academy Award®️-winning musical scores and world-class skating, making Disney On Ice presents Passport to Adventure a magical experience family will cherish forever. ‘Disney On Ice presents Passport to Adventure’ also features some of Disney’s favorite characters including Mickey Mouse and Minnie Mouse, Simba, Timon and Pumbaa from The Lion King; Ariel and Sebastian from The Little Mermaid; Peter Pan, Wendy and Tinker Bell from Peter Pan; as well as royal sisters Anna and Elsa from the number-one-animated feature film of all time, Frozen. “It gives us great pleasure to collaborate with Feld Entertainment once again.We would like to thank them for giving us the opportunity to host this production in the Kingdom. The extraordinary Disney show is one of the main highlights of Bahrain Tourism and Exhibition Authority extensive series of events and activities that aims to attract visitors and tourists from Bahrain, neighboring GCC countries and beyond, further strengthening the Kingdom’s position as the leading family destination on the global tourism map,” said the Chief Executive Officer of the Bahrain Tourism and Exhibitions Authority, H.E. Shaikh Khaled Bin Humood Al Khalifa. Tickets for the show are available at Bahrain City Centre and on manama.platinumlist.net with ticket prices ranging from BHD 10 to BHD 85 depending on the tier. Family packages are also available for the action-packed ice spectacular and saving of 15% on Bronze, Silver and Gold upon the purchase of 5 tickets. Hosting the ice show comes in line with the BTEA’s long term strategy to further develop the Kingdom’s tourism sector and strengthen its position on a regional and international level under the slogan of ‘Ours.Yours.’, which contributes towards the Kingdom’s economy and the 2030 Economic Vision.